These days mobiles and and smartphones seem to eat battery power - it's because of all the extra functions and uses. After all, we do our shopping, send messages, listen to music, search the web and take pictures using this single device. So if your smartphone seem to inhale its battery life, there's nothing worse than running out of juice just as you're about to make an important call. Don't you wish you could have battery backup wherever you need it? 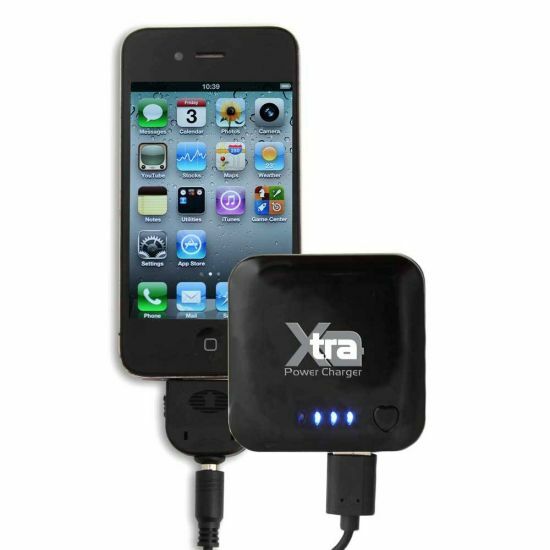 The Xtra Power Charger gives extra recharge for your gadget on the go! Not only can it charge an iPhone's battery from flat to more than 80% on one charge, the charger can be used a whopping 500 times in its lifetime. To check the capacity of the charger, simply press the button on the front to see the LEDs light up. If the LED lights show a low capacity, simply re-charge the charger with your computer via the included USB. The 2000mAh power charger is pocket-sized and comes with 6 included adaptors for Mini USB, Micro USB, Apple for iPhone & iPod, Nokia 2mm (not for Nokia E66 and 5800), Sony Ericsson and Samsung. Keep it on you at all times and the Xtra Power Charger's battery boosting ability is likely to save your day more than once! Press the button on the front to see the charger capacity - LEDs light up depending on the charge available.